John (1763) It is possible that these are two different Johns if, for example, the first had died; but they are recorded as being born on the same day of the year (27 Feb) which looks highly unlikely. Probably a transcription error. Agnes (1772) Another double. Perhaps the first Agnes had died early. John Smith of Edinburgh (b. 27 Feb 1761 or 1763 Torryburn - d. 1846 western Sydney), carpenter, farrier and farmer, and his wife Mary Harley (1766 - 1835) were amongst the earliest free settlers in Australia. They were married in St. Giles, Edinburgh on 27 July 1787 (though this may be the registration of their intention to marry) at which time John Smith was described as a Cabinet maker of Old Gray Friars Parish; Mary Harley of the same parish was the Daughter of Robert Harley, Officer of Excise at Torryburn. Torryburn, Fife, is a small town just across the Firth of Forth from Edinburgh (56�'30.21"N, 3�'20.08"W - see photo) in coal country. Robert Harley of Tillycoultry and Mary Downie of Stirling, the author's great-great-great-great-great-grandparents, were married in the parish of Tillicoultry on 28 Nov 1765. David (born Torryburn, 2 Oct 1785). Governors Hunter and King wanted to make the NSW colony self-supporting and when King was Lieutenant-Governor he interviewed men including Smith, McDougal and Bowman in London 1797 with this in mind: the three men were engaged as carpenters to build a corn mill in Parramatta. John Smith was the only one living in Scotland but the other two had Scottish origins and they were firm friends. Their passage was arranged by the Duke of Portland on the Barwell, a Thames-built (1782) East Indiaman of 796 tons, reputed to be a fast sailer, on her maiden voyage to New South Wales under Capt. John Cameron. The Times reported that the Barwell was in the Downs on 11 Oct 1797 together with another ship bound for Botany Bay and two warships. This was in the middle of the Napoleonic wars and transports tended to travel in convoy (e.g. to St. Helena) escorted by RN vessels. The Barwell left Portsmouth on 7 Nov 1797, presumably in such a convoy. The Barwell arrived in Sydney on 18 May 1798. Nine of the 296 male convicts aboard had died en route. There had also been an attempted mutiny or two, subsequently hushed up: see separate story. 'Arrived the Barwell East India ship, JOHN CAMERON, Esq. Commander, from New South Wales and China, put in by contrary winds. Sailed from St. Helena the 6th of July, in company with the Armenia country ship, Tellicherry extra ship, and Triton, with upwards of 300 French prisoners from Madras, under convoy of the Cornwallis armed ship, of 18 guns. Parted company the 24th ult. off the Western Isles [=Scilly?]. Colonel ORR, Captain and Mrs NANGE, Lieutenant and Mrs GRAHAM, Lieutenant HASWELL and Lieutenant REDDISH, came passengers in the Barwell; the latter of whom sat [sic] off this evening with dispatches for the Government and the East India Company. The Company's ship Glattan, bound to India, arrived at St. Helena a few days previous to the Barwell's sailing. When the three families arrived in Sydney there had been a change of Governor and the corn mill job had lapsed. All three families received land grants in the Hills District (i.e. Baulkham Hills), stayed close friends and their children intermarried. In the 1828 census (the population of NSW did not exceed 40,000 souls), we find John Smith, 66, CF Barwell 1798 (i.e. "came free" on the Barwell in that year), P (Protestant), Settler of Baulkham Hills; and Mary Smith, 60, CF Barwell 1798; and William Smith, 21, BC (i.e. "born in the colony"). The other children had left home. Mary, 34, CF Barwell 1798, P, is safely married to James Elder, 50, CF R. Admiral 1800, P, and has a tribe of children, including Ann, 7. 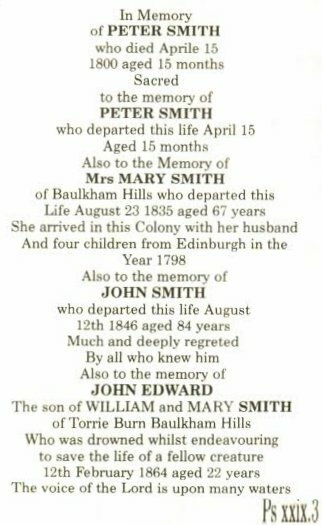 Although the early records assist by identifying people according to their ship and year of arrival, and status (convict, came free, born in the colony), names like John and Mary Smith can still lead to confusion. There was at least one other unrelated Smith on the Barwell in 1798. In any case, in the 1828 census, the following are to be found: Robert Smith, 36, Barwell 1798, Landholder, Campbell Rv., Bathurst - presumably the same Robert Smith who in the Muster List of 1823/4/5 is "employed by Mr Marsden, Parramatta" (see below); John Smith, 34, CF, Barwell 1798, P, Farmer, Res. Lr. Portland Hd. with 24-year-old wife Emma Maria, BC, and 4 children, all of course BC; James Smith, 33, CF, Barwell 1798, Presbyterian, Superintendent of Govt. Stock, Grose Farm, Petersham, and his wife Ann Maria, 28, CF, Nile 1801 and 15-month-old son, BC. Robert, b. Edinburgh 19 Apr 1788, bapt. St Cuthbert's Edinburgh 26 Apr 1788, d. Bathurst NSW, 15 Dec 1851. Became a grazier in the Bathurst district of NSW where he employed the convict couple William McPhillamy and his wife Mary (nee Scott) who had both been transported for 7 years. When this overseer William McPhillamy died in 1838, Robert Smith married his widow Mary (1792-1851) and, being childless himself, left his estate to the McPhillamy children (except the eldest, for some reason). Mary, the author's great-great-great-grandmother, b. 31 Dec 1790, baptised St Cuthbert's Edinburgh, 1 January 1791, her father being shown as a Wright (i.e. carpenter) in Richmond St. - see the James Elder narrative. John, b. 27 March 1793, baptised St Cuthbert's 30 March 1793, m. 8 Nov 1819 Emma Maria Doyle (1804-1858), d. 8 Mar 1854 at 'Birnam Wood', Singleton NSW, 10 children. This John Smith also owned a New England property at Bundarra which he called "Torryburn". Margaret Hardwick comments: John Smith Jr. was a fairly dour Scot who took to keeping a diary in the last eight years of his life (1846-54). Life was difficult for him in these years. There was a bad drought, money was tight, there was a depression and the banks were foreclosing. John had gone guarantor for his brother-in-law, Andrew Lewis McDougal(l), using his Bundarra property as collateral. Andrew didn't keep up the interest payments and John tried unsuccessfully to persuade the Bank of New South Wales to compel Andrew to pay his debts. John felt the only course left to him was to sell the Bundarra property; through his friend Rev Joseph Cooper, he sold this property to Charles Blaxland in August 1849. John Smith's wife Emma Maria, born in the colony c. 1804, was the daughter of Andrew Doyle (1774-1841), an Irish forger from County Wicklow transported for life on the Rolla in 1803. Doyle was accompaned by his wife Sophia and three children; she booked a cabin. When they arrived in Sydney, Sophia bought a house in the Rocks and applied for a grant of land at Toongabbie. Andrew was assigned to her as her servant. Sophia also purchased land near Lower Portland on the Hawkesbury River. They had a family of seven and accumulated 1220 acres of land, 14 horses and 130 horned cattle. Andrew's brother James was also convicted as his accomplice. The story is that Andrew had hidden the paper for forging the British pound notes in James's house without telling him. Andrew hid the forging press in his own house in the privy. Andrew was colourful to say the least: he was a talented artist and did watercolours for the Governor. He was also quite literate and wrote many letters to Ireland. In one letter he wrote that the journey to Australia was the best holiday he ever had. Andrew had a taste for rum and was liberal with his opinions: one was that Rev Samuel Marsden talked a lot of rubbish, and that landed him in gaol on bread and water. So he then wrote a famous letter declaring the Rev Marsden was a waste of a good blacksmith. Andrew wrote that the Irish revolt in Sydney would not achieve anything and that has stopped some family and historians from claiming he was an Irish dissident. Andrew's wife Sophia was Huguenot by descent and other than when he was trying to get Fr Therry to get him out of goal, Andrew was Protestant in practice. Andrew and Sophia are buried at St Matthew's Church of England, Windsor. James Doyle on the other hand was actively Roman Catholic and involved in the Roman Catholic church at Windsor. James, b. 6 Sep 1795, baptised St Cuthbert's Edinburgh 19 Sep 1795, m. 12 July 1826 at Scots Church in Sydney Anna Maria Bowman, d. 28 Oct. 1851 Eastern Creek NSW, 9 children. As well as farming with his father, brothers and brother-in-law James Elder at Toongabbie, Baulkham Hills and Eastern Creek, he supplemented his livelihood working on various government farms, the earliest being Castle Hill Government farm. By the time he married in 1826 he had been superintendent at Grose Farm [the site of Sydney University] and Longbottom Agricultural Station for two years. James's first three children were born at Grose Farm. He took over Emu Plains Agricultural Station temporarily in September 1829 and was promoted to Superintendent at Emu Plains and Superintendent of Government Stock in August 1831. He probably never took his family to Emu Plains as he already owned 'Smithfield' farm at Eastern Creek. He left Emu Plains when it closed in August 1832. James was an enthusiastic civil servant who worked to achieve his best but his numerous ideas and schemes were never fully accepted by his superiors. He was the last Superintendent at Emu Plains who oversaw the closure of the convict establishment. He worked at various farms at Bathurst and Smithfield while retaining his Eastern Creek estate. James's daughter Mary Ann m. 1850 John Bootle, innkeeper at the Bell and Crown; 12 months later she had a baby daughter. Soon thereafter the young couple had a domestic dispute and Mary Ann fled home to her parents with the baby. The circumstances were bad enough for her father to come to the inn to collect her belongings with a horse whip to punish his son-in-law. In the struggle that followed John hit James over the head with an iron bar, killing him. John Bootle was charged with manslaughter and received a six-month sentence. See newspaper articles re coroner's inquest and the trial. His wife returned to him and they had a son in 1853. Two years later, on 12 Jan 1855, John Bootle died in a road accident at the age of 40. Peter, b. Dec. 1798 Baulkham Hills, d. Apr 15 1800 aged 15 months, eventually interred in family vault, St Johns Cemetery Parramatta. Frances, b. 1802 Baulkham Hills, m. 5 July 1819 Edmund Doyle (1799-1871), d. 17 July 1868 - 12 children. William, b. 2 Feb 1805 Baulkham Hills, m. 23 June 1840 Mary Reynolds, d. 28 Oct. 1880 Castle Hill - 7 children. 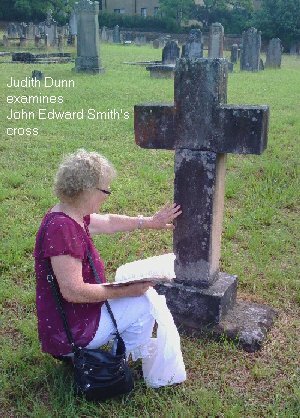 There is a sandstone Latin cross at St. John's Parramatta "in memory of John Edward, eldest son of William and Mary Smith of Torrie Burn Baulkham Hills, who was drowned 12 February 1864 aged 22 years". From the inscription on the Smith family vault we further learn that he was "drowned whilst endeavouring to save the life of a fellow creature". Andrew, b. 1806 Baulkham Hills, d. in fall from horse 12 Aug 1853, Molong. John Smith Sr. and others were jailed during the Rum Rebellion for refusing to participate in what they considered an illegal muster ordered by Johnston and Macarthur. (Most of the early free settlers were pro-Bligh.) Shortly thereafter, he was restored to favour and served on what is said to have been the first jury in N.S.W. John Smith and his descendants became leading pioneers and citizens of the Bathurst-Orange-Cudal-Molong districts. 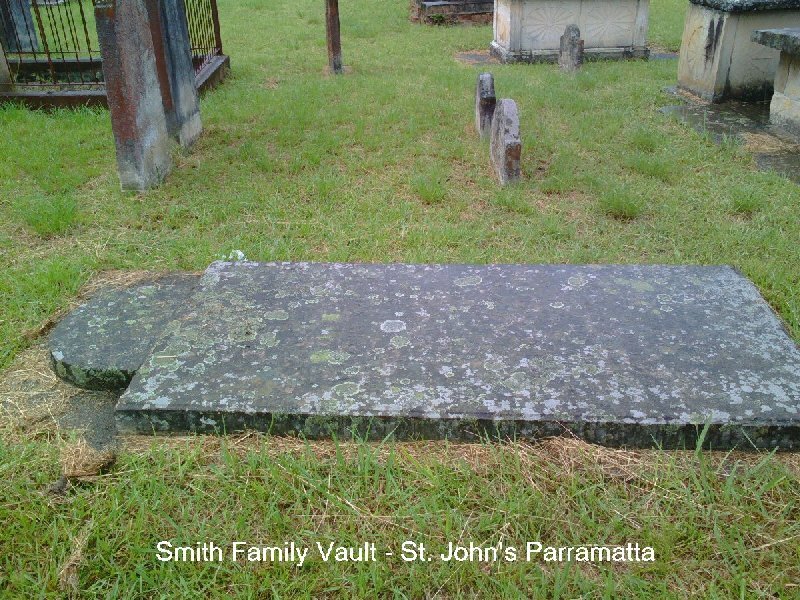 John Smith died in Baulkham Hills on 12 Aug 1846, aged 84 years, and was buried in the family vault in St. John's cemetery, Parramatta where his wife Mary was also buried after her death on 26 Aug 1835.